Mika writes another blog that describes them, that’s fun to read. Reminds me of the first twins I ever knew – Sanjeev and Rajeev – who used to be in my class from Std II to IV. 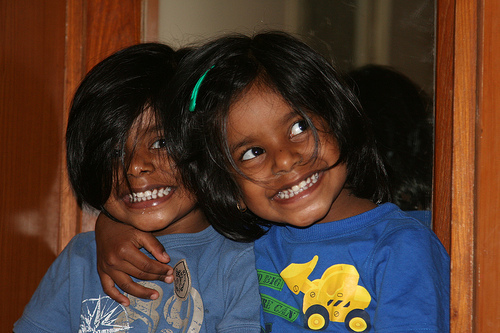 They used to be called to someone’s house in Gundawli to apply some kind of balm – because that person believed that if twins did it, his recovery would be speedy! The amazing thing was – he actually got better! Talk about Faith! Recently I heard that among the millions of students who appeared for a competitive exam, six were chosen to represent India at the international level. Of these six, two were twins. Fancy that! That’s so exciting! My mother and I were always enchanted about twins – and how we wished I’d have twins! 😀 – somehow the idea is so endearing. We’d go ga-ga every time we saw those advts on TV featuring twins. As it is, observing resemblances between parents and kids is something I’ve always been fascinated with. It never ceases to take my breath away to see a mother or a father walking with their child/children – sometimes appearing as though cast from the same mould! This reminds me of Padma-Vishnu and the first time we saw them back in ’87. Eight-month old Vishnu looked like a tiny version of Padma. Ah, and what about Raju Chitti – all their kids looked so alike! So much so – we thought that in the course of growing up, even Chitti and Chittappa seemed to resemble each other! I recall how people would be shocked when they first saw me – especially if they knew my father – because I used to look almost identical – don’t know about that really – but certainly easy to recognize. Why, even I got fooled when I bumped into him back in 1997 in Chennai – I was so sure I knew this person, even without guessing he’s my father. Yikes! It was like looking into a mirror – the features were so familiar. God’s a weird chap, eh? However, I know God’s a She. It’s like – every time Vidur says “Oh, My Goddess!” I burst out laughing. And I think, why not? Sigh – in the meantime, we’ve been busy with trips to the dentist for Vidur. Four teeth have been extracted – and now – its time for the braces. Praying that everything goes smoothly. For now, its the upper jaw. It’s likely to take over a year, and it seems like a long journey. Like they say – what’s gotta be done gotta be done. I’ve been doing the pep talk thing all the time to make him feel confident. Health, after all, is wealth. Have also got to go see Dr Raghu about my hand. Getting to be quite painful of late. Not sure if I sprained it or what. Won’t know until I consult, will I? Sigh. Maybe I’ll go tomorrow. Can’t ignore it anyway. 😀 I had instant coffee this morning – so funny after all the talk about filter coffee and the mechanics yesterday! Just couldn’t wait for the ten minutes the filter takes to yield the “Digaaashum”. Reminded me so much of those days, not so long ago, when I used to wake up around 5 am to work, since I couldn’t find two hours at a stretch during the daytime. Mom would call out at 5 – and I’d jump of out bed. Then wash up, set the coffee filter to percolate and sit to work. At 6.15 am, Mom would get up and boil the milk. I’d keep the curtain drawn in the study where I worked and mom would draw it aside, and grinning at me – ask “kalakkattuma?” I’d grin back and say yeah…just a minute. I’d wind up what I was doing and join her. We’d sit and ceremoniously savor our coffee, sometimes in the verandah in the fresh air. We did this regularly until 8 months ago. Even when mom could not have coffee, I would still make it a point to sit with her and have mine, while she had Horlicks, since she could not tolerate the coffee with antibiotics. After she suddenly passed away in Feb this year – I thought that I would never again want to have coffee. Sigh. I think of her being around me watching, smiling, loving all the time. And so, starts another busy day. Have a great one, every one! Mika – as you can see, the pleasure is totally mine. 😀 100% value addition to my blog!